Sell Your Las Vegas Home for 4.9% Total Commission. and have been licensed since 2004. I worked at such brands as Coldwell Banker, Windermere, Prudential, and Berkshire Hathaway. Now I have taken the same marketing and service techniques from those national companies, improved it, and applied it at a lower-cost independent brokerage. 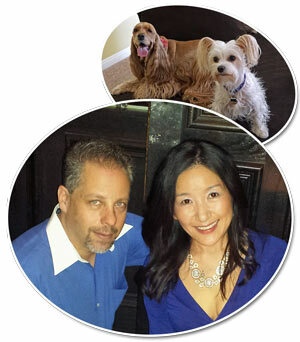 We would like to get to know you and sell your Las Vegas area home. 1. We can make our clients very happy by selling their home at a lower commission while still making enough money for our families. It’s your equity, keep it! 2. We have the know-how. Not everyone can operate at our margins. We have the real estate and managerial expertise to market and sell your home efficiently and effectively. We leverage technology to reduce our operating costs. We don’t skimp on marketing your listing either; The savings come from smart business operations. We provide MORE marketing and do it BETTER than most other agents/companies who charge more. We list and sell your home for just 4.9% commission. Yep, unlike some agent’s advertisements, that includes compensating the buyer’s agent as well. “Pictures are worth a thousand words,” it is said. We think they are worth thousands of dollars more to your selling price. Photos are the first things that catches buyer’s eyes–showing your home in its best light is one of the best marketing tactics. After all, these photos are going to appear on the MLS, brochures, and widely on home listing web sites like Realtor.com, Zillow, Trulia, and 100’s more. Better pictures = more clicks = more chance to sell your home quickly at the highest price. We use the latest in digital photography equipment including a mirrorless high-resolution camera with standard and ultra wide-angle lenses to capture entire rooms in vivid detail. We are careful to take great, high-quality photos that show off your home in the best light. We take around 80 photos and use the best ones to market your property. 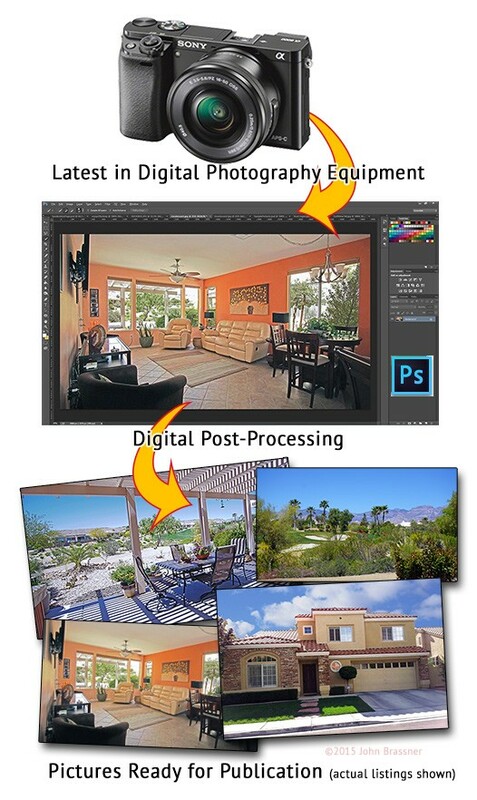 When needed, we also “post-process” or “touch up” the photos that need a little extra help using Adobe Photoshop. Will other listing agents do all this? Cheaper doesn’t mean cheap. Full MLS listing. We craft the listing in such a way that the listing will show up with the most frequency as possible in other agent’s searches and in consumer web searches. Yard sign or window/panel (when allowed). Our catchy yard sign will get people to call us and pitch the merits of your property. Promote to all Southern Nevada (GLVAR) Agents. We will send a flyer by email to all of the local agents. kills. Cheaper doesn’t mean cheap. 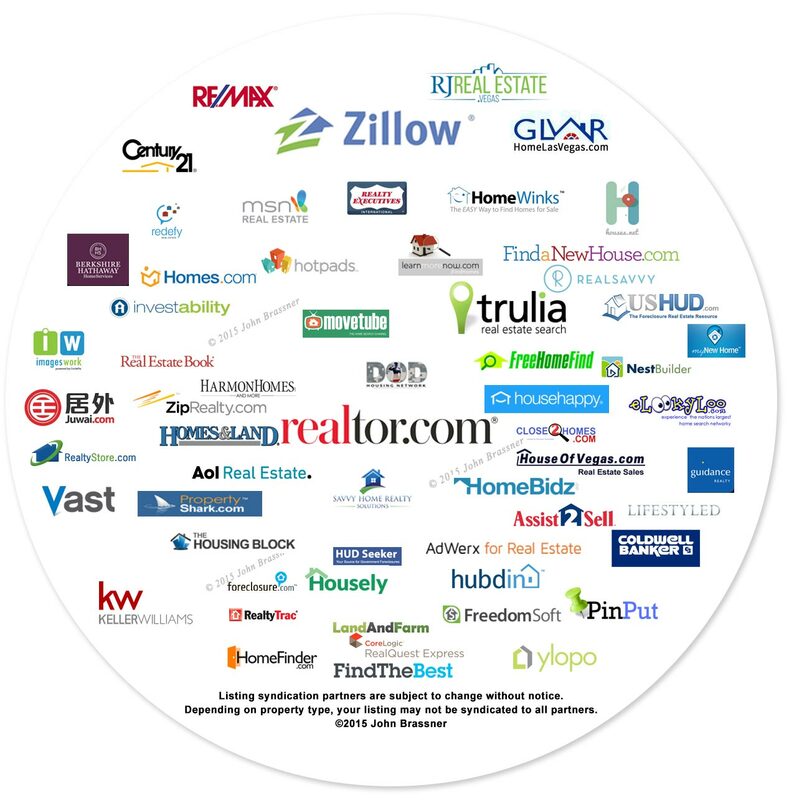 Redfin and 100’s of other sites (well, actually over a thousand but we didn’t want to sound too good to be true). Zillow.com. Although we think their “Zestimates” are horse-malarkey it is the #1 most-visited real estate website so we give it extra attention. We make sure we add emotional marketing messages to the listing. The Big-Name Franchise Companies. Want your listing to be on Coldwell Banker, Century 21, Berkshire Hathaway, Keller-Williams, and all of the other more expensive franchise brand sites? Yep, your listing will be there too (it’s an industry “secret” called “broker reciprocity”), all listings are on all of those sites. In other words, we all have the same listings advertised. If you list with us, your listings will also be displayed on all other participating brokers’ sites—almost all brokers in Nevada and all of the important national sites. Except, we aren’t a franchise and don’t have to pay franchise fees. We pass the savings on to you. We promote your listing to all of the Las Vegas area real estate agents and we cooperate fully with all buyer agents. Yep, that’s all included in the 4.9% total commission. er of your home may not speak English as their first language? They may not even live in the United States (investor). We want to make sure we reach out to all potential buyers of your house. 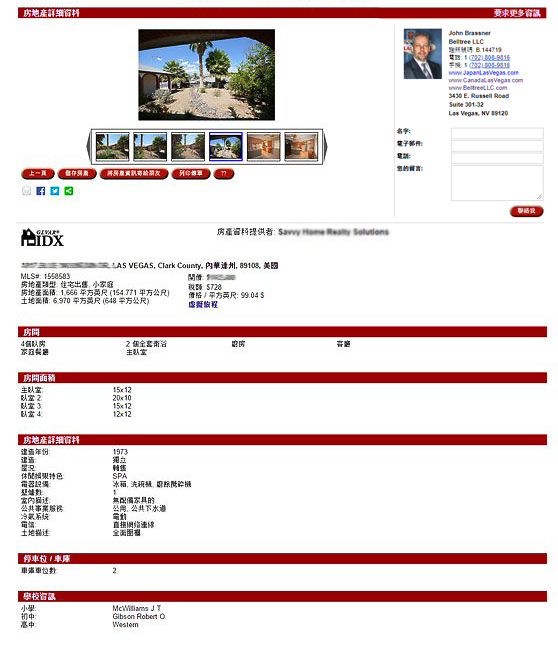 Here is an example of a listing translated into Chinese. So, how can we provide such exceptional services at such a low price? Smart Operations. Technology. Lower costs! We don’t have fancy offices lined with marble and exotic woods. Our low-rent means lower costs. We don’t even have a smiley-faced receptionist at the front door; We don’t need one and you don’t need to pay us for one; We are going to meet you at your house most likely anyway! We don’t drive super fancy cars; You don’t need to pay my car payment. Our brokerage is not a franchise. We don’t have to pay big bucks to a franchiser who just takes that money and spends it on “brand recognition” (er, expensive executive salaries). We’d rather spend it on marketing your listings and lowering our commissions. Industry secret: Your listing will still appear on every major franchise’s website when you list with us! It’s called “listing reciprocity” or “IDX.” Why pay more when we do more for less. Oh, and we don’t add on “Broker’s Additional Commission” or “File Compliance Fee” and other such nonsense junk-fees that many of the franchise brands charge. We also don’t pressure you into a particular escrow company or home warranty company–we don’t have ownership in either and thus don’t have a conflict of interest. Stop the madness! We are computer literate. Some even call us whizzes. We know how to market your home online effectively. We do it all day long. As long as it is convenient for our sellers, we can do most paperwork and process offers electronically including obtaining signatures. It is safe and secure. This allows us to operate efficiently and pass the savings on to you. Have you seen some of the real estate teams out there? They have dozens of people on their staff. Why? Perhaps they aren’t competent in all aspects of real estate. Or, perhaps they are flush with money from charging too much? We are a nimble team and pass the savings on to you. We are ready to prove to you that we are better and less expensive. Let’s get your home sold! Ready to Sell Your Home or Have Questions? Contact us now. Fill out the form below (preferred method) or call us at 702-808-9816.